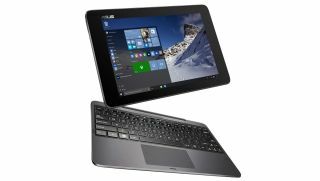 Asus has unveiled a refresh to its best-selling hybrid device, the Transformer Book. The T100HA keeps the same form factor – a 10.1-inch one - and tweaks a few things. Out goes BayTrail and in comes Intel's Cherry Trail chip, its successor with a choice of X5 models being proposed. The memory gets a boost to up to 4GB with onboard storage ranging from 32GB to 128GB. Like the 12-inch MacBook, it will come with a USB Type-C reversible connector but also adds a microSD card slot, a micro HDMI and a micro USB port as well. The detachable keyboard comes with a USB 3.0 port. At 8.45mm thick and 580g, the T100HA (at least the slate part) sits firmly between the iPad 3 and the iPad Air in terms of dimensions and weight. There's also a 5-megapixel rear camera and a front facing 2-megapixel one just like on the previous model. Its biggest flaw though has to be its resolution. At 1280 x 800 or 1366 x 768 (depending on the specification), it is unlikely to be viewed as a competitor to the Surface 3 despite bundling a keyboard docking station that can not only house a hard drive but also increase its battery life to 14 hours. Available in the third quarter of 2015 with Windows 10, it will have a starting price of $289, with the docking station with the more expensive model costing $399. Techradar Pro has teamed up with GoDaddy to produce a website-hosting tips eBook, looking at how to plan your website, picking the right domain name and great ways to promote your website. Have a read and let us know what you think. The aim is to inform and provide insight to those interested in building their first real website. iPad Pro 12.9 (2018) vs Samsung Galaxy Tab S4: what’s the best premium tablet available now? Are flying cars the future of motorsport?